A: I love to sit back, relax and look out the window or read a book. I arrive at my destination refreshed and energized rather than exhausted and stressed! A: I enjoy watching the passing scenery, feeling glad that I am not caught in the traffic on the freeway. I also enjoy reading a book or newspaper as I ride. A: The A-train and buses are clean and usually right on time. The staff is very friendly and helpful – they will answer any questions you have. Give it a try! Thanks for sharing with us, Cynthia! 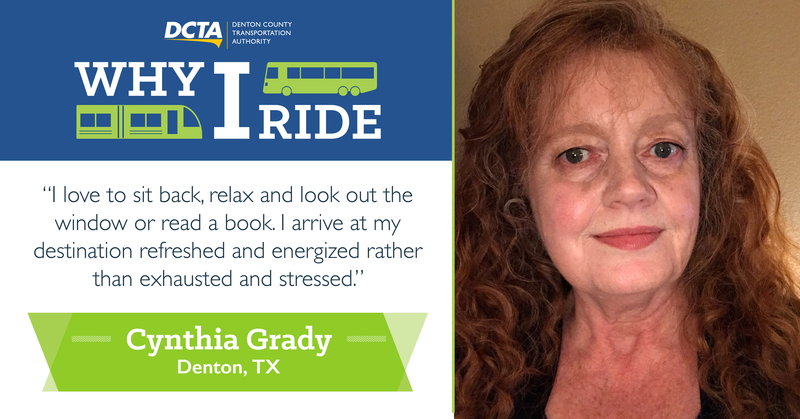 Make sure to tell us why you #RideDCTA here for a chance to win 10-pack of regional day passes (valued at $84 and valid on DCTA, Dallas Area Rapid Transit (DART) and Trinity Metro! Click here to submit your story.